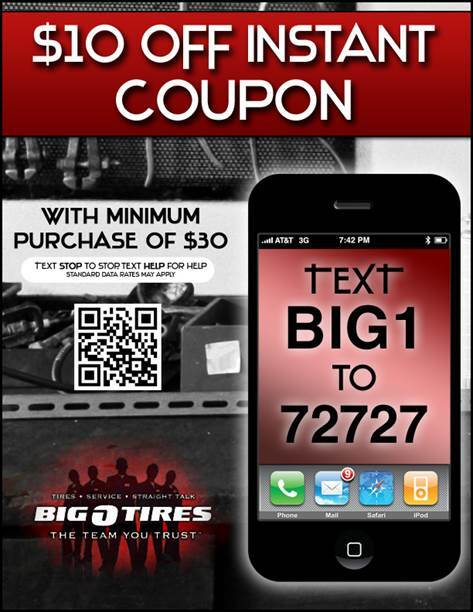 Big O Tires | Mobile Marketing as it should be, easy and available. Big O Tires came to AvidMobile to help them with their loyalty and lead generation marketing campaigns. The ideas were to capture customer current customers through point-of-sale engagements by texting a keyword to the Big O Tires dedicated vanity short code. Each store would build their store specific SMS database of customers and then be able to remarket to those customers via text or email through the AvidMobile SMS application. Big O Tires dedicated short code wasn’t fully provisioned at the time they wanted to start their campaigns so AvidMobile provided one of their many shared short codes so they could meet their campaign deadlines and get started. Besides delivering mobile coupons and text message offers 2 or 3 times a month to their current clients that opted-in to their campaigns, they also added SMS short codes to their traditional media buys and marketing campaigns like radio, television, and print. This enabled them to build databases of potential customers, track effectiveness of promotions, and send out remarketing SMS coupons and offers to drive them in-store. Big O Tires saw great affect from their campaigns with great Return-on-Investment. They also reported their marketing staff enjoyed the ease of use of the AvidMobile SMS and email application.